The Sustainable Development Goals (SDGs) include a target to “significantly reduce illicit financial and arms flows, strengthen the recovery and return of stolen assets and combat all forms of organised crime” (Target 16.4). However, there is no globally agreed upon definition for “illicit financial flows” (IFFs). My new CGD paper looks at why there is so much disagreement and confusion over this term. 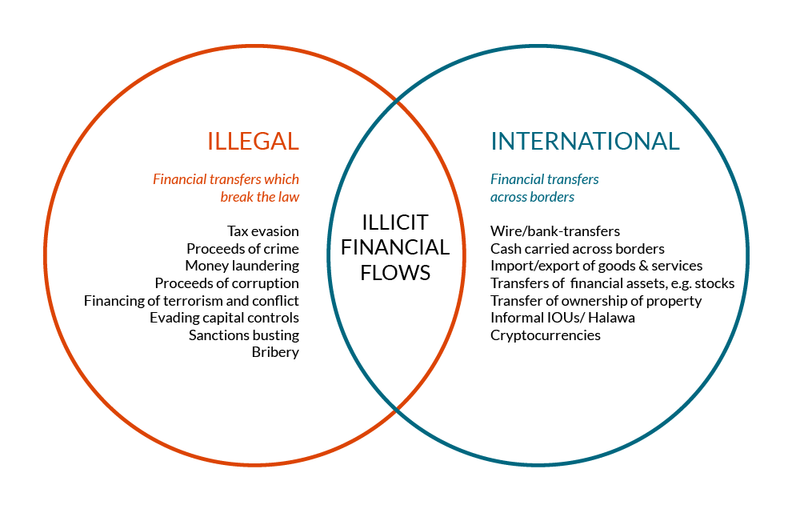 Sandwiched between gun running, stolen assets, and organised crime in the Global Goals, it is clear that the core idea of illicit financial flows is concerned with “dirty money” that crosses international borders—one common formulation is money that is “illegally earned, transferred, and/or utilized.” This includes the proceeds of crime and corruption: illegal trade, embezzlement, bribes and kick-backs, terrorist finance, and misreported transactions that evade tariffs or taxes. In countries with foreign exchange controls, movements of money dodging currency controls would also fall under the definition. The idea of illicit financial flows is important because it highlights that crime and corruption are not just the problem of the country where they happen, but of the countries that allow their financial systems, goods trade or real estate markets to be used as getaway vehicles for ill-gotten loot. All of this seems relatively clear (although difficult to measure—such financial flows are obscured and hidden by design). However a case has also been made, for example, by coalitions such as the Global Alliance for Tax Justice and the Global Financial Transparency Coalition that illicit financial flows should be defined more broadly in relation to breaking some line of moral acceptability. In practice this argument does not aim to draw up a list of morally acceptable and unacceptable things that people could do with their money (which would of course be impossible), but is focused on a particular issue; that “tax avoidance” should be included within the IFFs definition. This would bracket legally compliant taxpayer behaviour into a single category with criminal and corrupt money flows. I argue that this broad approach is not coherent, and undermines the rule of law. One argument for taking the broad approach, which is often seen as compelling is the idea that there is a large “grey zone” reflecting an absence of clear defining lines between legal tax planning and tax evasion. Transfer pricing and trade misinvoicing are often highlighted as representing this overlapping practice. This is usually illustrated with big estimates, such as that trade misinvoicing drains $800 billion (USD) annually from developing countries, or that it is responsible for $50 billion of illicit flows from Africa. While there are of course real legal uncertainties and enforcement failures, it is becoming clear that these issues are not well represented by adding up gaps and mismatches in trade data, which often do not reflect misinvoicing at all. Even more fundamentally it is a mischaracterisation to interpret “misinvoicing” as an example of the same kind of thing as legitimate questions over transfer pricing. On the one hand is customs fraud and smuggling, which is a channel for illicit financial flows, and on the other there are ordinary questions over determining acceptable “arms-length” prices for subsidiaries of a multinational corporations to charge between themselves. For example, a report by Olivier Longchamp and Nathalie Perrot of the Swiss NGO Public Eye provides a good outline of how commodity price manipulation can be used as a means to enable illicit (i.e., illegal) financial flows. 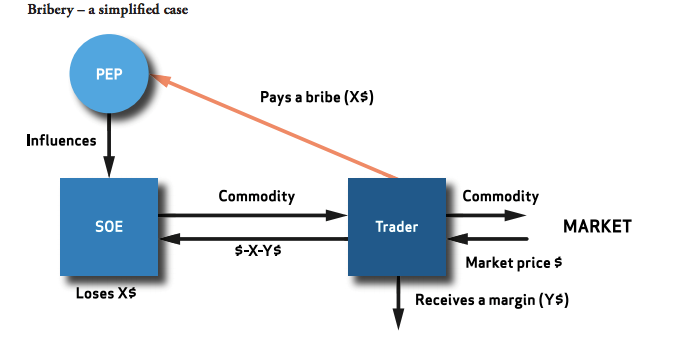 They map out several different arrangements between trading companies, “politically exposed persons,” and state-owned enterprises to transfer bribes and kickbacks by misreporting the value of commodity trades (the diagram below is only the simplest of a series). Excluding multinationals from illicit flows? It is sometimes argued that excluding legal tax planning or resulting “misalignment” from the definition of illicit financial flows means excluding multinational corporations from the scope. However, this is not true, instead it draws the line between corporations acting lawfully and acting in ways that break the law or that abet crime and corruption. The Swiss Eye report highlights cases such as abuse of the Iraq Oil for Food program involving Glenclore, Vitol making payments to individuals close to the President of Congo-Brazzaville, Glencore (again) over-billing ore from Kazakhstan and paying commissions to a close advisor of the president, and Alcoa’s involvement in trade price manipulation in order to make side payments to a minister in Bahrein. Other cases such as Siemens historic bribe paying and Operation Car Wash in Brazil (involving many companies including Petrobras and Odebrecht) are also well known. Another recent report The Plunder Route to Panama by the African Investigative Publishing Collective highlights how international financial centres (including London) become the end point for resources plundered through corrupt deals involving politicians and well-connected people. The South African Centre for Investigative Journalism amaBhungane has tirelessly investigated the use of manipulated contracts and misreported payments to deliver kickbacks and embezzle funds from public enterprises in South Africa. In the UK, Lord Peter Hain called for the government to seek a criminal investigation into whether HSBC and Standard Chartered banks facilitated the illicit transfers from South Africa. There is perhaps a fear that multinational tax avoidance will fall off the international development agenda altogether if it is not included in the SDGs under target 16.4. But there is a better place for considering the tax affairs of multinational corporations in the global goals. That is under target 17.1: strengthening domestic resource mobilization. Rich countries should consider how their tax rules and treaties, the development of international tax norms, and the conduct of multinational corporations may support or undermine tax collection in developing countries. Strengthening the consistency of international tax rules and the administration of tax law so that they are neither weakly enforced, nor capricious and predatory would be positive for citizens, businesses, and public budgets, and is good for both inward investors and host countries. Bundling everything under a weakly specified and easily sensationalised category of “illicit financial flows” undermines trust, understanding, and the ability to have constructive conversations about how to do this.